Bear with me – I’ll eventually get to the environmental aspects of printing – including digital printing. But I think it’s important to know the basic steps and processes in order to be able to understand green claims. So there will still be a Printing – part 3 before we get to the environmental topics. Specific fiber materials and dye types interact with each other in well defined ways, and it is these interactions that determines the best composition of a printing paste or ink. The preparation of this paste is one of the most important steps in printing. (note: paste and ink seem to be interchangeable names for the same substances). It requires a set of special characteristics – one of the most important is that the paste be viscous (like paint or pudding). Printing paste ready to use. This quality is called “flow”. The choice of an agent to create this flow (called a thickening agent) is a critical component. In addition, each printing method we talked about last week (flat bed, screen or rotary), as well as the nature and sequence of fixation and aftertreatment steps requires a specific kind of printing ink or paste. After making the printing paste, it is essential to strain or sieve all colours in order to free them from lumps, fine sand, and other foreign objects, which would inevitably damage the highly polished surface of the engraved rollers and result in bad printing. Every scratch on the surface of a roller prints a fine line in the cloth, and too much care, therefore, cannot be taken to remove, as far as possible, all grit and other hard particles from every color. The straining is usually done by squeezing the paste through filter cloths as artisanal fine cotton, silk or industrial woven nylon. Fine sieves can also be employed for pastes that are used hot or are very strongly alkaline or acid. All the necessary ingredients for the paste are metered (dosed) and mixed together in a mixing station. Since between 5 and 10 different printing pastes are usually necessary to print a single pattern (in some cases up to 20 different pastes are applied), in order to reduce losses, due to incorrect measurement, the preparation of the pastes is done in automatic stations. In modern plants, with the help of special devices, the exact amount of printing paste required is determined and prepared in continuous mode for each printing position, thus reducing leftovers at the end of the run. Pastes which are entirely water-based are obtained by replacing the white spirit with water. high proportion of extender to improve wet-on-wet properties. The coloring matter used can be either dyestuffs or pigments. 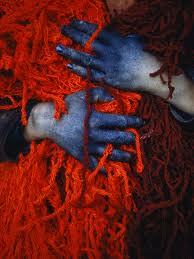 Dyes are in solution and become chemically or physically incorporated into the individual fibers. The dyes used for printing mostly include vat, reactive, naphthol and disperse colours which have good fastness properties. Pigments are largely insoluable, so often organic solvents are used (such as benzene or toluene). The pigmented printing paste must physically bind with the fabric, so must contain a resin, which holds the pigment in place on top of the fabric. The binder is decisively responsible for the fastness of the pigment prints during use. The most important fastnesses are wash fastness, chemical cleaning fastness and friction fastness. The handle and the brilliance of the colours are also influenced by the choice of binder. Binders are in general “self-crosslinking polymers” based mainly on acrylates and less commonly on butadiene and vinyl acetate, with solid contents of approx.. 40 – 50%. (2) Binders made of natural wood resin, wax stand linseed or safflower oils and chitosan were tested in order to obtain biodegradable printing paste. Promising results were reported when using chitosan as a binder, and no solvent was necessary. Solvents are usually added in the formulation of the thickeners. The type of paste (emulsion vs. plastisol) and thickening agent determines the type of solvent needed. White spirit is a commonly used organic solvent, as is water. The organic solvent concentration in print pastes may vary from 0% to 60% by weight, with no consistent ratio of organic solvent to water. Water based solvents may still emit VOC’s from small amounts of solvent and other additives blended into the paste. The liquid waste material of water based pastes may also be considered hazardous waste. The most important auxiliaries are the thickening agents. 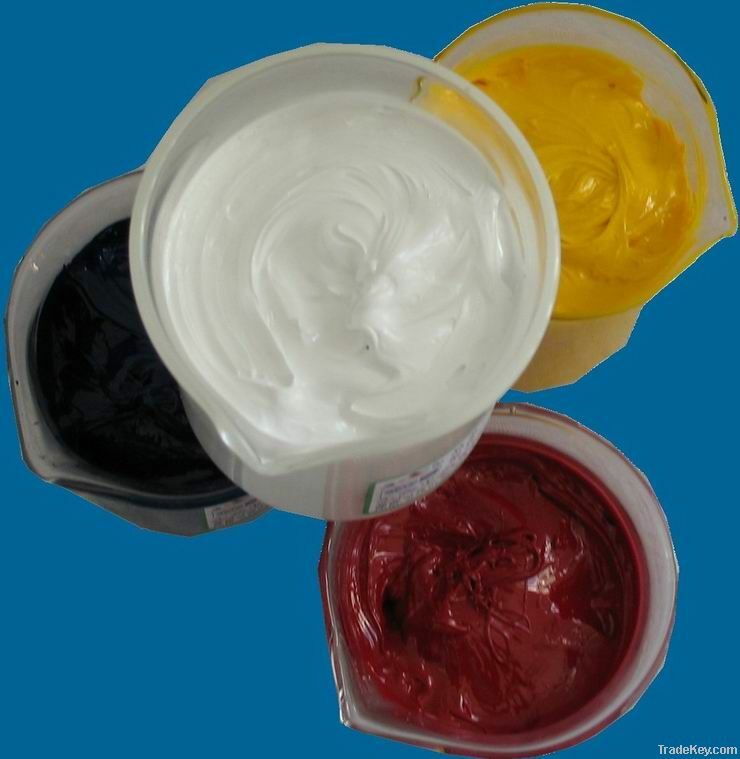 Printing paste normally contains 40 – 70% thickener solution. 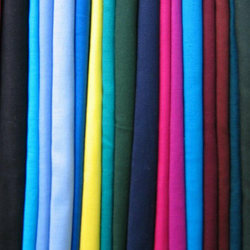 The printing thickeners used depend on the printing technique and fabric and dyestuff used. Typical thickening agents are starch derivatives, flour, gum Senegal and gum arabic (both very old thickenings, and very expensive today) and albumen. A starch paste is made from wheat starch, cold water, and olive oil, and boiled for thickening. Starch used to be the most preferred of all the thickenings, but nowadays gums or alginates derived from seaweed is preferred as they allow better penetration of color and are easier to wash out. Hot water soluble thickening agents as native starch are made into pastes by boiling; the colorants and solvents were added during this step then cooled, after which the various fixing agents would be added. 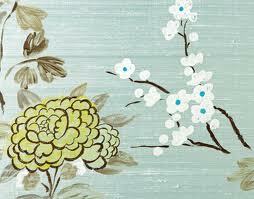 Colors are reduced in shade by simply adding more stock printing paste. For example, a dark blue containing 4 oz. of methylene blue per gallon may readily be made into a pale shade by adding to it thirty times its bulk of starch paste or gum, as the case may be. Mechanical agitators are also fitted in these pans to mix the various ingredients together, and to destroy lumps and prevent the formation of lumps, keeping the contents thoroughly stirred up during the whole time they are being boiled and cooled to make a smooth paste. Most thickening agents used today are cold soluble and require less stirring. Almost exclusively synthetic, acrylate-based thickening agents are used in pigment printing – or none at all, since the mix of resins, solvents and water produces thickening anyway.